Would you pay $10 for an entire offline copy of Wikipedia, the crowdsourced encyclopedia of information that you can get on the Web for free? WikiPock, a Paris-based startup, has compressed the entire English language version of Wikipedia to under 4 gigabytes (not including images), and is selling it for mobile phones. The other language versions are smaller (it also comes in German, French, Polish, Dutch, Italian, Portuguese and Spanish). The application lets you search and read Wikipedia articles on your mobile phone without an Internet connection. It can be downloaded directly, or on its own microSD card. For $15, you can download updates, but only for a year. The first 30 people to send an email to tc[at]wikipock[dot]com will get a free copy. It is available for Blackberry and Windows Mobile phones right now, and will soon be available for the iPhone, Android, and Symbian phones. 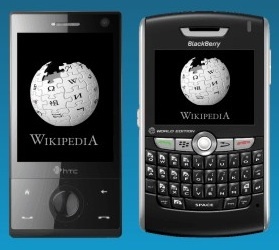 Since all of these phones can access Wikipedia via their browsers, what you are paying for is offline access, a mobile-friendly format, and fast search. Consumers seem more willing to pay for mobile apps, even when the same information is free on the Web (witness the success of paid apps in iTunes). And at least WikiPock is giving back to the Wikipedia community. Ten percent of all sales will be donated to the Wikimedia Foundation. Update: For those with iPhones, there is a competing app called Encyclopedia that does pretty much the same thing, and also costs $10.